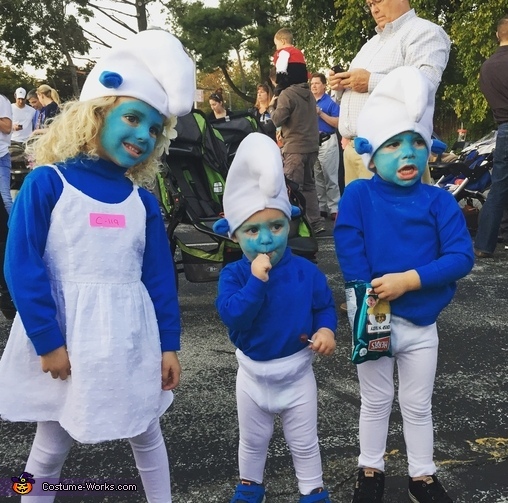 This homemade costume for kids entered our 2016 Halloween Costume Contest. I made the hats out of fleece, which was super cheap, and stuffed the top with some old pillow stuffing. I didn't use a pattern, I just cut the hats out and adjusted where necessary when I was sewing. I got the blue turtlenecks from LL bean (which by the way were impossible to find because who ears a turtleneck anymore, let alone in the color blue). And yes, I made my boys wear girl's white leggings. I sewed little blue fleece tails onto their tushes and painted their faces. The costumes were a hit and so inexpensive to make!